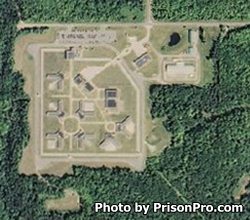 Baraga Correctional Facility is a mixed custody facility in Michigan that houses level I and level V adult male inmates. It is considered a maximum security institution because it houses level V offenders inside seven housing units surrounded by a secure perimeter. Level I offenders are housed in a 280 bed unit outside the secure perimeter and many of the minimum offenders offer supportive roles to the institution. The institution is secured by two fences with razor wire, electronic motion detection systems, multiple armed guard towers, and a patrol that operates 24 hours a day. The current capacity of this prison is 896. Offenders at Baraga Correctional Facility are provided with medical and dental treatment directly at the prison. Inmates can also participate in treatments for substance abuse and various mental health issues. All prisoners are encouraged to utilize the education system within the facility, which currently offers inmates the opportunity to take adult basic education courses and earn a GED. The day and time Baraga Correctional Facility inmates are allowed visits will depend on their level. The visiting hours for this facility have recently changed. Please visit the Michigan Department of Corrections website here for the latest visiting hours.